School starts in my neck of the woods next week. When I was a kid that would’ve meant my barefoot days were nearly over for the year. Growing up on the farm, we pretty much took our shoes off on the last day of school and didn’t put them on again (except for church) until summer ended. I ran through the yard without a thought for bees. Walked across the rocky driveway without flinching. Hopped from rock to rock in Laurel Fork without slipping. (Well, maybe once or twice.) The bottoms of my feet were like rawhide. At night, Mom would sit my brothers and I one by one on the toilet lid and wash our feet with a warm washcloth. It wasn’t always worth the trouble of taking a bath, but she would at least scrape the grime from the bottoms of our feet. Once upon a time, people in Appalachia went barefoot to save their shoes. They didn’t have 30+ pairs lost in the back of the closet. Even my dad, when he was a kid, had limited shoe resources. But when I was a young it was just a preference. I remember begging to go barefoot in the spring when Mom would decree it too cold. There was a joyous freedom in being shoeless. Now I wear shoes to walk across the kitchen tile. I have to work up my nerve before darting out into the yard to fetch one of Thistle’s toys. (I mean, there are bugs and stuff.) I wear “water shoes” to go in the creek and consider wearing flip-flops in any shower outside my own home. And I find myself missing my feet of steel. Longing for the non-pressure of never needing to match my footwear to, well, anything. So here, in the midst of August, I pledge to go barefoot. To brave the grit I like to pretend isn’t on my floors. To let the grass tickle my toes. To dip my feet in the creek. And to mourn the passing of summer–those glorious days without shoes. Do you remember that you had to waer shoes to go to Pat and Bob’s? Your cousins were not allowed much barefooting because their yard was heavily filled with clover and thus BEES. As a child in the forties, I remembering my mom saying we could start going barefoot when we could cover 3 dandylions with our (smallish) foot and we had to wear shoes after Labor Day. The scourge of our barefooting was crossing the blacktopped street on 90 degree days!! Hey, my feet are cute. I forgot about wearing shoes at the cousins! Oh, blacktop is the bane of bare feet. My children are constantly pulling their shoes off right now! I’m always searching for where they put them. 🙂 I’m a combination of bare feet and shoes. I don’t mind letting my feet get dirty, but since my pregnancy with the twins (3 years ago) my feet haven’t been the same and I need more support than I’d care to admit. Thankful for a few more weeks of bare feet around here before school starts! I’ve heard pregnancy does funny things to your hair, skin, um, figure–but feet, too? Man. The things they don’t tell you in advance. I remember barefoot summers in Baltimore. We had gravel paths and terrace, and it took a while each summer to get our feet toughened up. Maybe a week or two? And yes, the asphalt was a killer, as were the hot sidewalks, but we didn’t care! Those were, in fact, mostly carefree days. Yeah, that first week sans shoes was tough, but by August you could have done that fire-walking thing without blinking. I was lucky enough this summer to spend a month in Buckhannon, WV visiting my parents. I was amazed at how different my feet looked at the end of that month. I had dirt from the garden underneath my toenails and the bottoms of my feet were a light shade of green from the fresh cut grass I walked on all summer. Wow! What a great feeling. I am back in Florida where I am wearing flip flops again. The grass isn’t so tender and there are many different critters lingering in the grass and our concrete (which is by the way much hotter than the concrete I was used to in WV) What a wonderful summer I was so lucky to have and what wonderful new memories we created while there. I love the memories your blog creates for me. I hope this will create new memories for you as well. Oh, I’m jealous of your summer back home! Are your parents in the same house? I can picture that gorgeous backyard and you in it barefoot! I used to love going barefoot, but my feet are incredibly wimpy now. And I can’t wear cute shoes unless they’re really supportive. I have 90 year old man feet. But when I was in Greece, I stuck my feet in the Aegean and even took pictures of my toes being all glamorous. I walked in the pebble-sand and then I limped for a few days,but it was worth it. Ahhhhh, barefoot in Greece. Now that sounds good!! I used to play golf barefoot. It was wonderful, not having to try to find spiked shoes in my size! And it made my game better. Well, until a fellow player stepped on my foot. Wearing spikes. Now, in New Mexico, barefoot is not a very good option. Barbara wears sandals outside. I think she’s nits – which she says she confirmed years ago, by marrying me. After THAT, exposing her feet to the spikiness of NM is child’s play. Yeah, New Mexico doesn’t make me think of barefeet . . .
What a fun post, Sarah. I used to love LOVE going barefoot in summer. And I’m with you, 90 degree blacktop always burned. 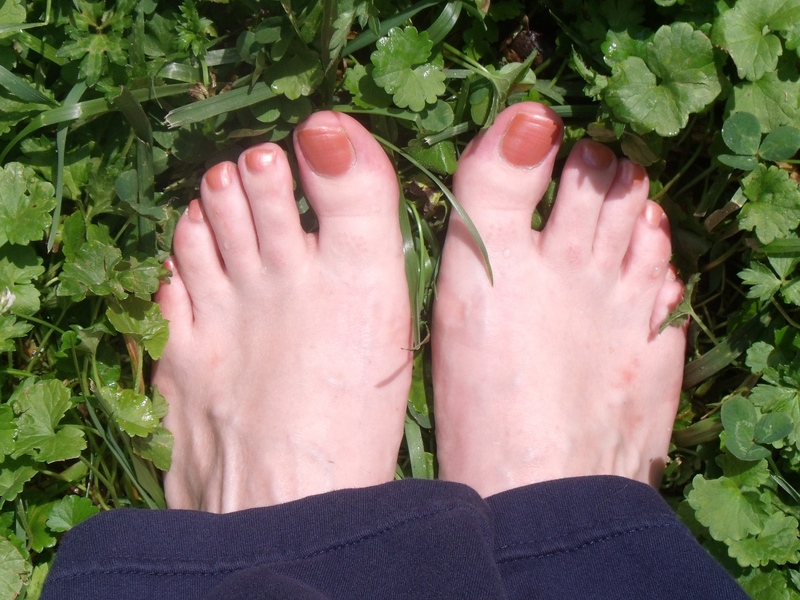 But putting my toes in the grass, the freedom of no shoes—my feet hated when school started back up again. I still do some barefooting, but it’s mostly around our house and back yard. I clean my feet every night in summer. And, (whispering) I drive barefoot. My kids love going shoeless too. I guess it’s a trait passed down. Or, maybe just an inherent joy in being a child. Gasp! Driving without shoes! My dad used to lecture me about that. Have I done it since? Um . . . could be . . .
Driving without shoes is the best because of absolute feedback between the feet and the pedals, and is not illegal. Tolerating blacktop is really just an exercise of progressively burning the feet–starting earlier in the day to start with and then getting later in the day towards afternoon peak heat–standing for as long as possible, walking for as long as possible… only looking for sidewalks or shade patches early on but at some point of heat training being able to walk always on the blacktop. Me, I got to be able to tolerate blacktop in the 100 degrees F heat index for over a half mile, and then sidewalks were effortless walked on for miles at a time. Hello sarah, not sure of the lady who commented that you are brave to post your feet. They are barefeet, and yes your toes are cute.